Happy weekend everyone! Wow 52 Saturday's Critters have flown by. I can not believe it has been a year already. Ok, it's time to share your critters.. Any kind of critter will do.. I appreciate everyone who has linked up in the past and for those who are linking in on this week's critter party. And of course I always appreciate my blogging friends stopping by just for a visit..Also, I hope you can check out the post at Annis's I'd-Rather-B-Birdin. You should also check out Misty Dawn's Camera Critters. I am sharing some more birds and critters seen during our Nags Head, Outer Banks trip..
A pretty American Wigeon seen at the Pea Island NWR in the Outer Banks. The American Avocets are beautiful birds. A cute Pied-billed Grebe another one of my favorite birds. I believe this could be a Pilot Whale! 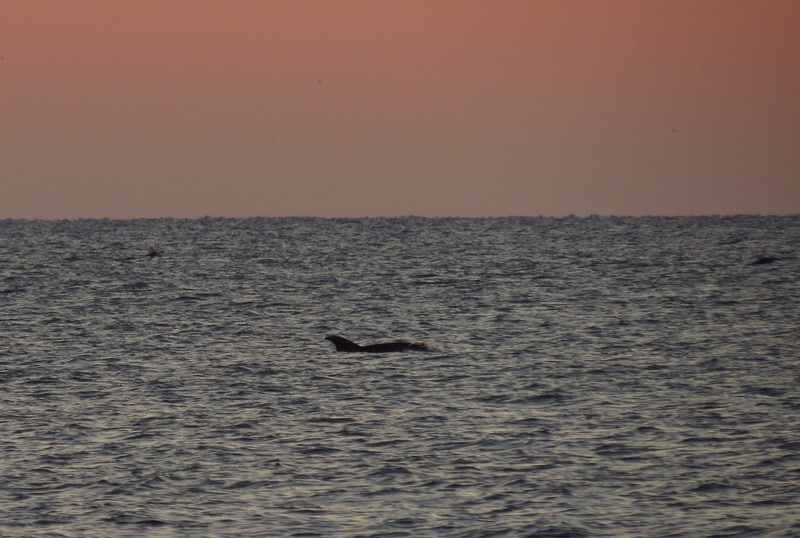 It was seen from the beach near our Nags Head hotel.. Hubby and I enjoyed watching the dolphins and these Pilot Whales. I watched the dolphins playing in the waves close to shore. An awesome sight to see. The Dolphins we saw were gray in color and what I think is the Pilot Whale were darker black sea mammals swimming by. A cool sighting..the dolphins and pilot whales.. I hope you enjoyed my birds and mammal from the Outer Banks.. It is an awesome place to visit, even during the off season.. Thank you for linking up to the critter party. I also appreciate the visits, comments and the support of my blogging friends................... Have a happy weekend! Please visit: I'd-Rather-B-Birdin. Thanks to the gracious host: Anni. Also check out Camera Critters. Thanks to Misty for hosting this fun meme. What lovely sunset colours in your seascapes. It must have been a lovely break. Those are awesome photos of the whale, and as for dolphins... I haven't seen them in a really long time. The last time was in Port Aransas several years ago. I never tire of watching them. Wow, how exciting to see those pilot whales! There's a few whales that look similar to pilot whales too (from memory, some names are 'melon-headed whale' and 'false killer whale') but I don't mean to blur the ID even more! What a lovely collection of shots! Nags Head looks like a wonderful place to visit. That looks a lovely spot to sit and watch the Dolpins and Whales and the birds were lovely also. Thanks for hosting. Have a wonderful weekend. Your birds are all so cute! 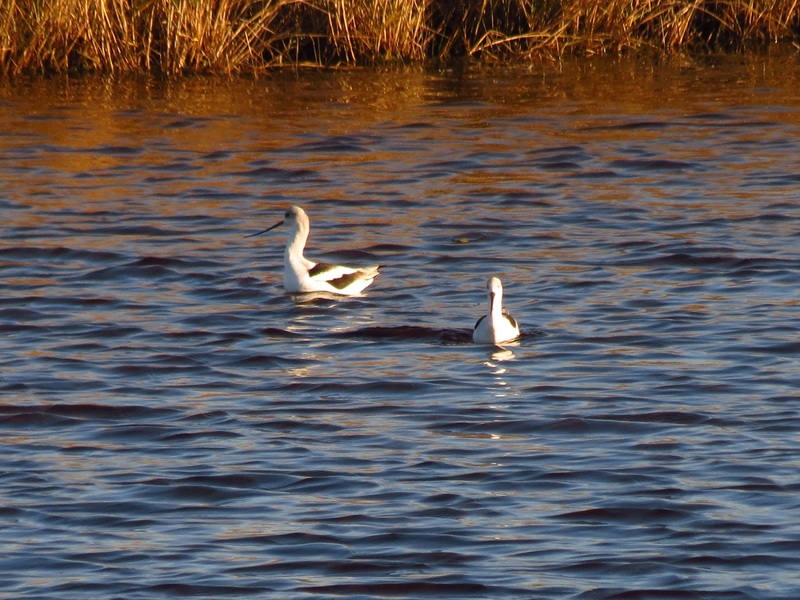 I love ducks, and the Avocets are so upright, they really stand out. 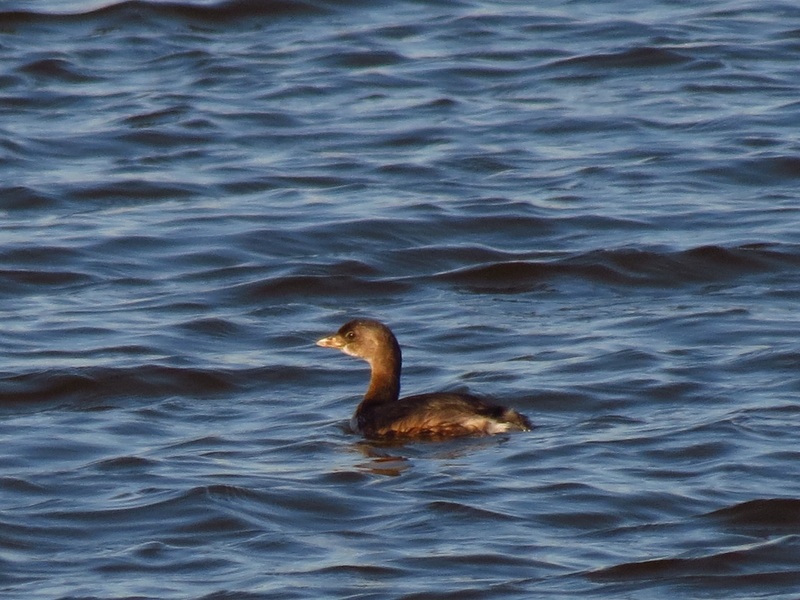 I like Grebes too, but don't think I've ever seen one in the wild. It's fun to spot whales and dolphins, too, it looks like a great trip. 52 Saturday's Critters with hundreds of critters. How nice to see those whales! Your photos are very beautiful, as always! Thanks for hosting. Have a nice weekend! Beautiful images of the birds. Happy Birthday to Saturday Critters Eileen. Like you, I can't believe another twelve months have gone by. 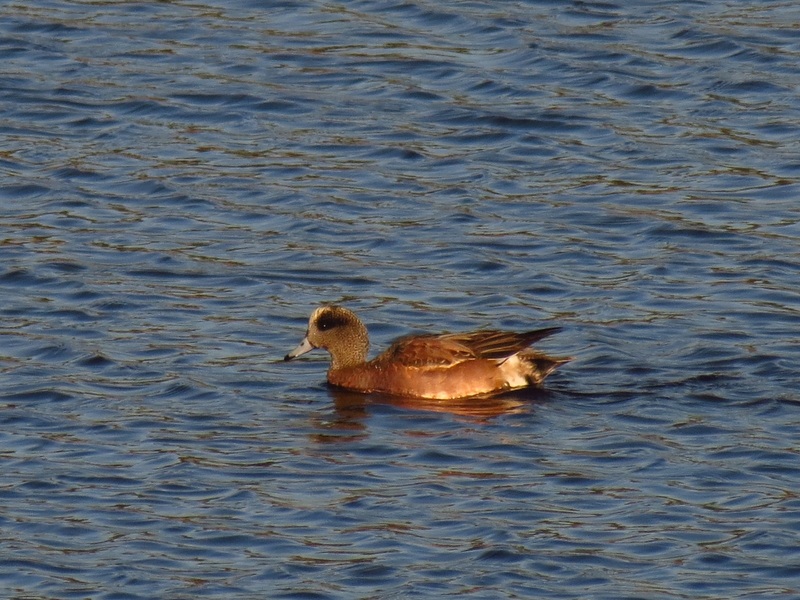 A really nice Wigeon and those American Avocets really stand out against the water. Cheers to the next twelve. whales and dolphins, oh my!!! I LOVE the avocets, that's some cool beak they have!!! wonderful images this week Eileen, have a fun filled weekend!!!! Wonderful to see dolphins and the whale! What an amazing place. Of course I love the birds too ... And I really really need to see an avocet again sometime. It has been years, somehow I always miss seeing them. Beautiful waterfowl shots! No matter what kind of whale that is, the photos are gorgeous! I like the silhouettes! Love so beautiful birds and critters, dear Eileen! Avocets have a grace and elegance all of their own. Wonderful creatures and beautiful photos. i would like to see the whales, have seen dolphins but not whales. and the water birds are beautiful. It's fun to catch a whale or dolphin. They are so fast and crest so briefly. Whales are so magnificent and your smaller critters are great too. Lovely birds!Lucky you saw a whale and dolphins on your trip! Great captures!Have a happy weekend! Hi Eileen, How exciting you got to see that whale! Wonderful. I like the Advocet and also the Widgeons. Have a really good weekend! Your birds are beautiful ! Thanks for sharing these wonderful photos ! Congrats on one year of "Saturdays Critters!" You captured some nice light in your photos above. How wonderful to see the dolphins! 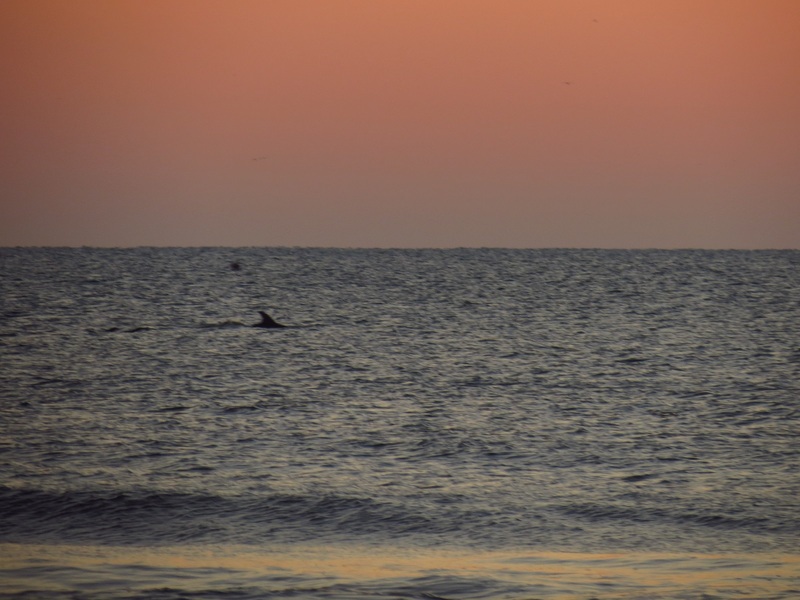 Great animal shots - we saw whales last time we were at Pismo Beach! Awesome shots, Eileen! It would be fun to see the whales! I love the color of the sky over the water, too. Have a nice weekend! I loved seeing more images from the Outer Banks. We did not see whales but there were plenty of dolphins when we visited. Have a great week! So amazing, the Whales, popping along. Well done Eileen. Oh my goodness. A pilot whale and dolphins! I would have been beside myself with joy! Loved your wigeon, avocets and grebe too. As always, a beautiful post, Eileen. Thank you so much! American Avocets are very elegant birds. One of my favorites. How exciting to see whales! Birds beautiful views of the sea and I can only envy. Regards. Thank you, Giga! Have a happy Sunday! Oh my, I love these photos ! Very nice ! I thought for a second there it was the fin of a shark. pretty images Eileen. What beautiful photos, Eileen - especially that second one with how the light affects the water! There's just something about Saturday. I so often forget to link up on the weekend! But here I am, late to the party. Thanks for hosting. I always enjoy your photos, and seeing Pilot Whales, is an added bonus! Great catch!! Love the pilot whale photos..Long time since I've seen one of those..Hope you're having a fun weekend..
How exciting to see the whales and dolphins and all those birds! Lovely lighting. I don't think I've ever seen a pilot whale! Dolphins yes! I love ALL the photos, but I particularly like the subdued colours, lighting and texture of the whale pix. Not to mention a cool capture! Hope you've had an awesome weekend! What great shots! I love the avocets, they're so pretty. And the whale and dolphins sightings are, I' sure, something you will remember for a very long time! Amei a luminosidade e os reflexos da segunda foto. YOUR PICTURES ARE VERY PRETTY. THANKS FOR GIVING ME THE OPPORTUNITY TO PARTICIPATE AND SHARE! Wow, a whale! Wonderful collection that you are showing us. Beautiful shots of your marine critters, Eileen! Thanks for the party! Happy Sunday, to you! Those avocets seem to have their breeding colors still!!! Wow. Thanks for sharing your link here this weekend!! Have a happy week ahead. A wonderful collection, great to see a whale close to the coast. Enjoyed your photos! How neat to see a pilot whale! Cool sightings of the dolphins and the pilot whales. You have had some amazing trips. Thanks for sharing them! Amazing sights you see . . .